I’m a big fan of incorporating movement as a part of learning! I’m one who really likes the low tech approach. I’ve seen great response from the low tech and that’s why I’ve continued to create products to use for that approach. However, I think any type of movement is great and that can include using technology! If it makes it easier for incorporating movement I’m all for it! 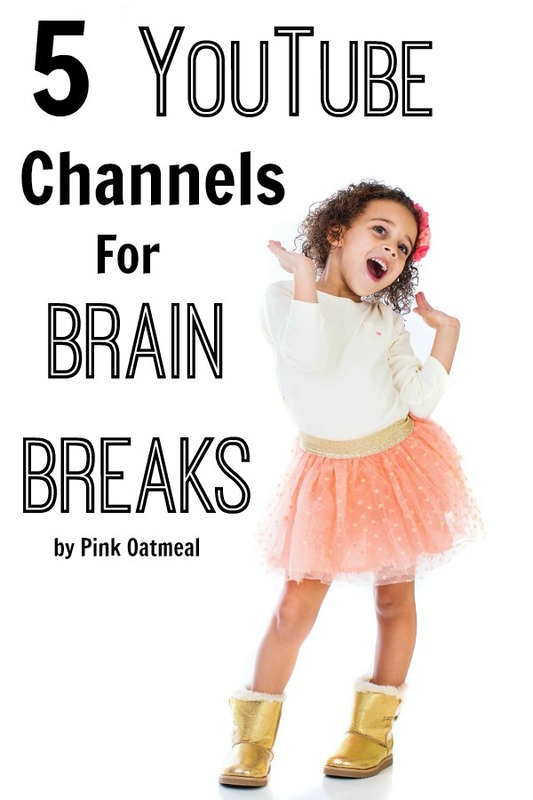 These 5 YouTube channels for brain breaks and movement and learning could easily be incorporated at school or home! Cosmic Kids Yoga – Here is one example of their yoga! Dr. Jean Videos – She does a great job of combining movement with learning. The Learning Station – Here is their Boom Chicka Boom song! Move To Learn – Here is one of their moving videos! Have Fun Teaching – They have a section dedicated to fitness songs! What’s your favorite You Tube channel for brain breaks and moving and learning? Love this list! Have you used GoNoodle.com? They have lots of great active stuff, including yoga and deep breathing exercises as well. Yes for sure I know Go Noodle and use it on occasion myself. I talk about it in my yoga resources post (https://www.pinkoatmeal.com/kids-yoga-resources-home-classroom/) and my brain breaks post (https://www.pinkoatmeal.com/brain-breaks/)!